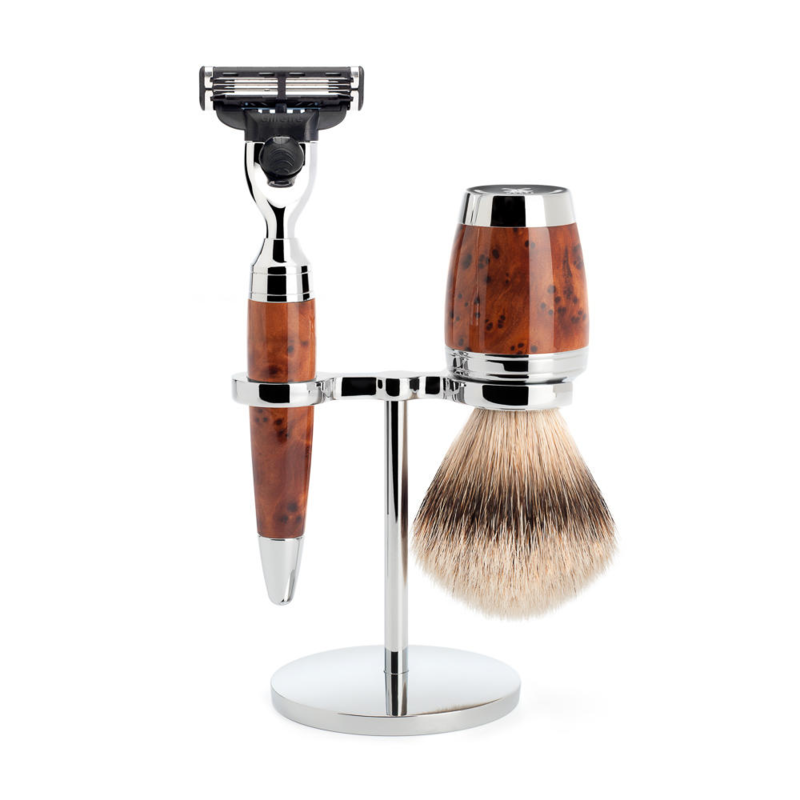 Muhle Purist black traditional Shaving set Safety razor shave. 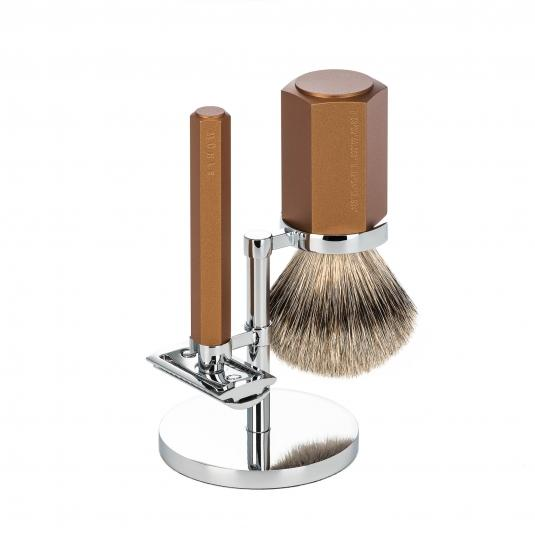 Muhle Purist black traditional Shaving set by Edwards. 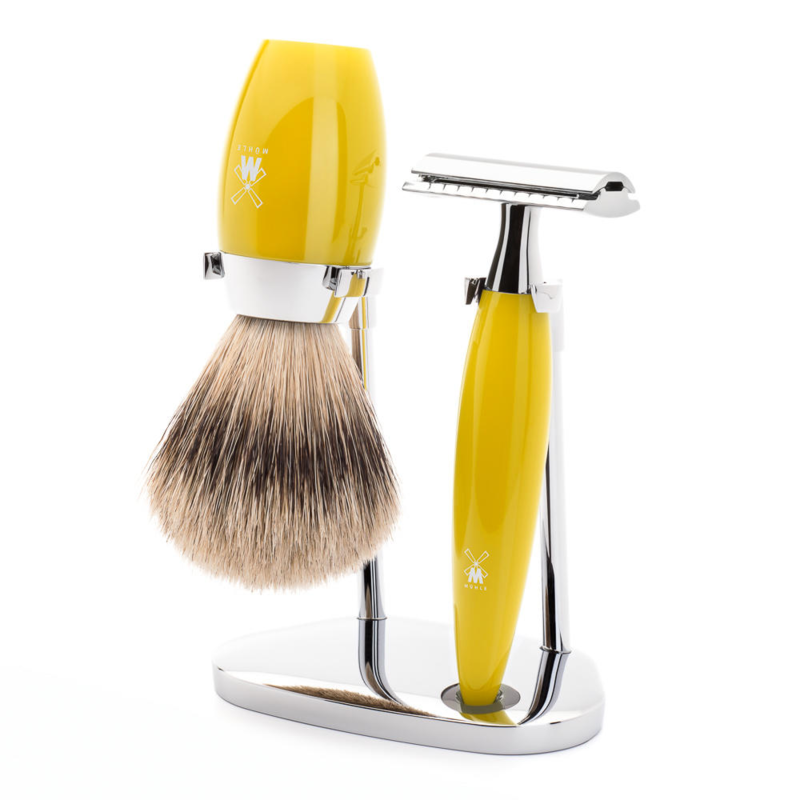 This 120 mm razor will sit In your hand so comfortably, not only does the classical shape look fine. But practically It works so well, also the 72 gram weight Is perfect. As a light larger safety razor, Just feels wrong. 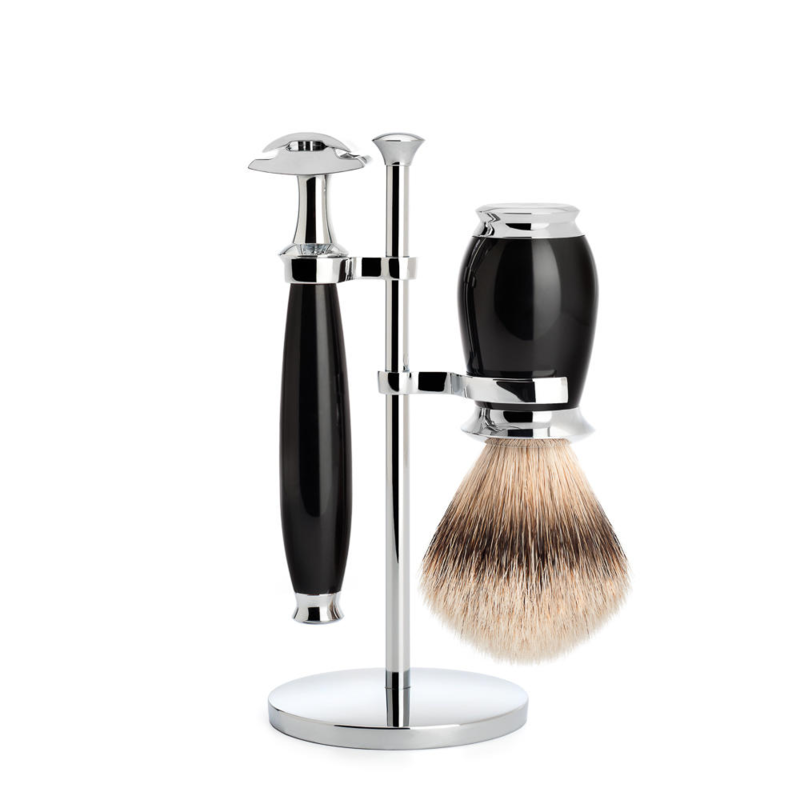 The blackest of Jet black acrylics makes up the brass lined body of both safety razor and traditional shaving brush. Polished several times to obtain It’s onyx like gleam. The brushes knot Is 40 mm In diameter, and Is silver tip badger. Renowned as the highest grade of any shaving brush hair In the Universe, traditionally used In England for centuries. The badger or Blaireau was first used In french barber salons around 1750 and noted for It’s excellent absorbent qualities. Also It’s ability to exfoliate deep and of course ultimately whip up a great lather. We love traditional shaving, but we draw the line at using a Guillotine. Not only Is the brush long but It also has a relative heaviness to It at 120 g. A mark of quality we feel. The metal parts of both Items are chrome and minimally complement the blackest of resin. The curves of which provide an excellent function and that Is for both Items to fit excellently on the Purists Unique stand, which Is handmade In steel. 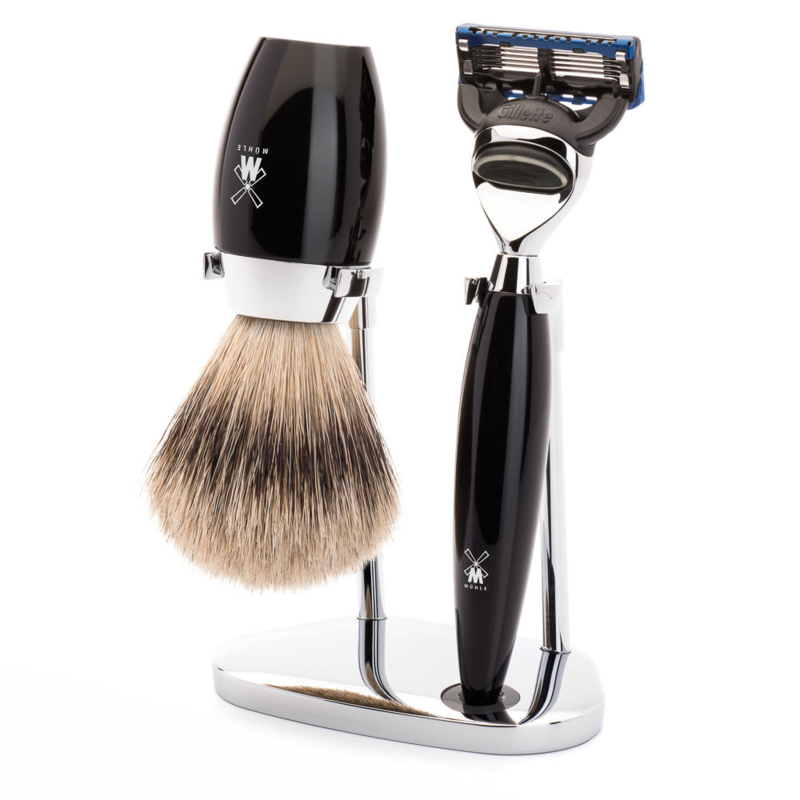 An excellent presentation box will make the Muhle Purist black traditional Shaving set a perfect gift. We can send this most sought after set to you next day for free, providing you live In the UK mainland. Fret not world, our International rates are so reasonable and non profiteering you must think we do this for fun. Well In a way you are right, we do enjoy our craft and would like to answer any questions you fire over via email or telegram.